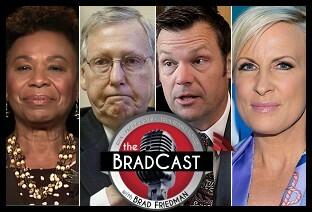 " Articles in Category: Joe Scarborough	"
Today on The BradCast we catch up with a lot of incoming from over the past week (or two) as Republicans officially begin to freak out about the likelihood of Donald Trump becoming their nominee and the possibility (perhaps, their hope) for a contested nominating convention, and as the U.N. climate conference heads into its final hours towards an agreement that might save the planet. 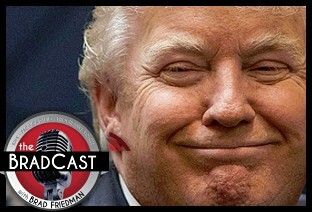 We cover quite a bit of ground on today's show, as you'll hear, so I'll just let you listen and make of it what you will, rather than go into great detail here. Suffice to say, we call out not just Republicans for the mess we're all now in --- from the rise of money in politics to to the rise of Trump to the rise of fear and fascism to the rise of global temperatures --- but also the mainstream corporate media. Had they not consistently failed to do their job over the past decade (or two), they might have kept this entire fine mess from happening in the first place. But why would want to? They are now the biggest winners of all. And the Democrats don't seem to be laughing about it any of it anymore. Enjoy the show. 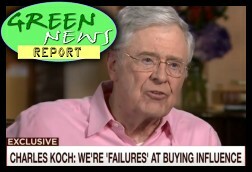 IN TODAY'S RADIO REPORT: Koch Brothers claim they are environmental stewards; New legislation to stop all fossil fuel extraction on federal public lands; More bad news for Volkswagen; PLUS: US State Department rejects TransCanada's request to hit 'pause' on the Keystone XL pipeline... All that and more in today's Green News Report! 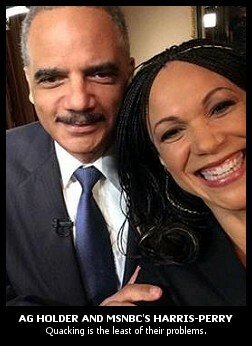 I hate having to agree with Fox Opinion Channel personality Megyn Kelly, but I can't dispute her point about the bizarre segment on the February 8 edition of MSNBC's Melissa Harris-Perry, in which Harris-Perry actually asked outgoing Attorney General Eric Holder to quack like a duck. Granted, MSNBC's weekend programming hasn't been the same since Chris Hayes left Up in 2013 to host his weeknight broadcast All In, but this segment was just too daffy. Holder, who answered graciously nonetheless, seemed to know that something had gone off the rails; while responding to Harris-Perry, he seemed to be second-guessing his decision to participate in the interview. 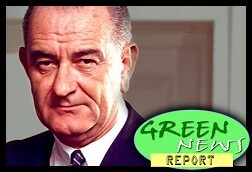 IN TODAY'S RADIO REPORT: Australia's climate change-denying Prime Minister Tony Abbott takes a coal drubbing; Record number of malnourished baby sea lions washing ashore in CA; BP's missing oil has been found - at the bottom of the Gulf of Mexico; PLUS: The first presidential warning on global warming was issued 50 years ago this week... All that and more in today's Green News Report! 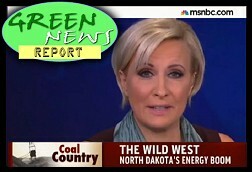 IN TODAY'S RADIO REPORT: EPA gives Obama reason to reject Keystone XL pipeline; Feds must account for rising sea levels; Scarborough calls liberals 'science deniers'; Extreme weather whiplash from Boston to San Francisco; PLUS: Majority of Americans (including Republicans) now want government action on global warming, won't vote for politicians who don't... All that and more in today's Green News Report! IN TODAY'S RADIO REPORT: Germany's biggest utility spins off its fossil fuel assets; Are fossil fuel companies running scared? 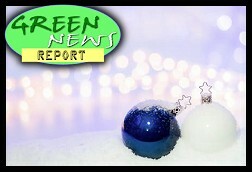 Florida punishes homeowners for not polluting; PLUS: MSNBC's big infomercial for Big Coal... All that and more in today's Green News Report! 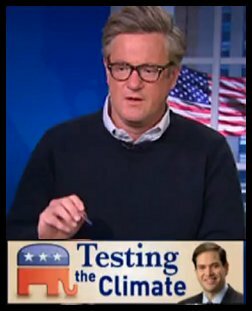 MSNBC's Joe Scarborough --- former Republican Congressman from Florida and, as of late, shameless advocate for the mendacious climate-change denying billionaire David H. Koch --- took to the airwaves this week to defend another mendacious figure, and another member of my former party: climate-denying extremist Senator Marco Rubio (R-FL). The conservative Republican and former U.S. Congressman from Florida turned MSNBC morning show anchor Joe Scarborough offered a powerful response this morning to the tragic mass shooting which killed 20 children and 7 adults in Newtown, CT last Friday. The often glib Scarborough who says he "received the NRA's highest ratings over four terms in Congress," took a very serious and non-ideological turn at the top of today's Morning Joe program on MSNBC. During his prepared remarks he cited the mass shooting at the Sandy Hook elementary school as a "true landmark" which, he said, forced him to spend "the past few days grasping for solutions and struggling for answers, while daring to question my long held beliefs on these subjects." "Every American must know," he said, "from this day forward, that nothing can ever be the same again." With an eye towards what he described as "entrenched special interests [who] will try to muddy the issues," he implored that "Politicians can no longer be allowed to defend the status quo. They must instead be forced to protect our children." "The violence we see spreading from shopping malls in Oregon, to movie theaters in Colorado, to college campuses in Virginia, to elementary schools in Connecticut, is being spawned by the toxic brew of a violent pop culture, a growing mental health crisis and the proliferation of combat-styled guns." 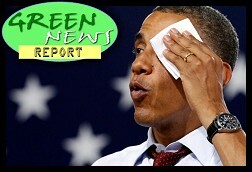 "The cause of these sickening mass shootings," he explained, "is no longer a mystery to common-sense Americans." Speaking from his former perspective as a powerful Washington D.C. insider during his days in the U.S. House, Scarborough went on to say: "I am a conservative Republican who received the NRA's highest ratings over 4 terms in Congress. 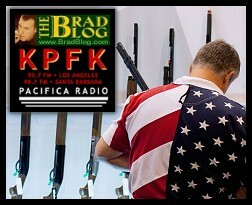 I saw the debate over guns as a powerful, symbolic struggle between individual rights and government control. In the years after Waco and Ruby Ridge, the symbolism of that debate seemed even more powerful to my colleagues and me." "But the symbols of that ideological struggle have since been shattered by the harvest sown from violent, mind-numbing video games and gruesome Hollywood movies that dangerously desensitizes those who struggle with mental health challenges. Add military-styled weapons and high capacity magazines to that equation and tragedy can never be too far behind." "Friday changed everything," he continued. "It must change everything. We all must begin anew and demand that Washington's old way of doing business is no longer acceptable. ... Our Bill of Rights does not guarantee gun manufacturers the absolute right to sell military-styled high-caliber semi-automatic combat assault rifles with high capacity magazines to whoever the hell they want." Joe Scarborough and Pat Buchanan have at each other debating President Bush's stay the course policy in Iraq in this entertaining clip (10:00) from yesterday's Scarborough Country. Buchanan actually defends Bush despite calling the war a "horrible mistake" and suggesting that the President may be acting with his legacy in mind. Scarborough finds Buchanan's stance perplexing since he knows that "there are not ten Republicans on Capitol Hill that agree with this President" and that the "President stands alone in the world in his view on Iraq". The clip begins about 3 minutes into the segment while the real fireworks start at approximately the 7 minute mark. Finally, despite all appearances, the clip is not cut off at the end as Scarborough only goes on to thank his guests. Joe Scarborough, Bob Shrum and Pat Buchanan all go off on e-voting machines earlier today. Scarborough and Shrum also wonder what Republican's have against paper trails. All three pundits look for Democrats to retake the House. Last night on MBNBC Scarborough Country, Joe Scarborough was surprisingly polite during his interview with peace activist Cindy Sheehan. Cindy Sheehan is joining other peace activists today who are undertaking a 140 mile march to protest the Iraq war and demanding that Iraq war monies be diverted to Hurricane Katrina relief. CNN reports on the peace/anti-war activists who are marching 140 miles to New Orleans. The video in this report is from yesterday's segment of the march. One protester carried a sign saying "Make Levees Not War!"